LONDON, UNITED KINGDOM, April 3, 2019 /EINPresswire.com/ -- The US Army have awarded Microsoft Corp. a $480 million contract to supply prototypes of augmented reality systems, for use on combat missions and in training. This contract could eventually result in Army purchasing over 100,000 headsets, in its plans to "increase lethality by enhancing the ability to detect, decide and engage before the enemy,” according to a government description of the program. 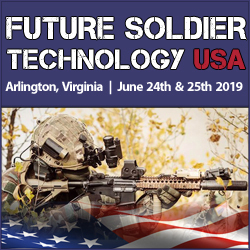 With this in mind, SMi Group are pleased to host the Future Soldier Technology USA Conference, taking place on June 24th and 25th 2019, in Arlington, VA. The event will discuss how new technologies and agile approaches to soldier modernization can help produce a more “expeditionary, mobile, hardened, and intuitive” war-fighter. Delegates will learn about the role of augmented reality technologies and lethality, from a presentation by Colonel Travis Thompson, Chief of Staff, Soldier Lethality Cross Functional Team and Director of Soldier TCM-S, US Army CDID. US DoD representatives can pre-register for free admission to the conference, which is subject to final approval.